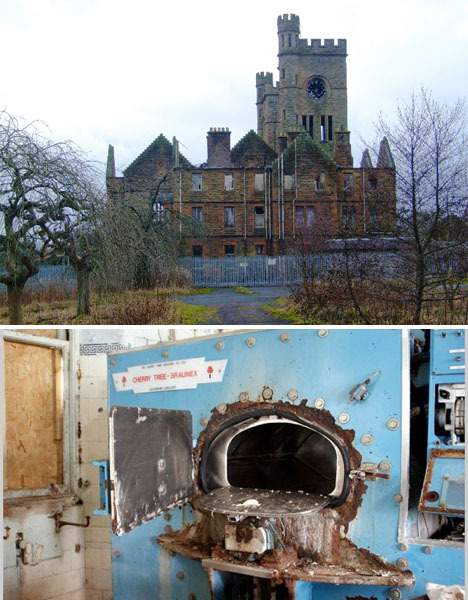 Perhaps there’s something special in the Scottish temperament that explains the presence of such an unusual number of stunning castle-like abandoned hospitals. A certain appreciation for history cloaked in moss, ivy, and – inevitably – graffiti, which is a jarring sight on the crumbling stone walls of rural Gothic mansions. 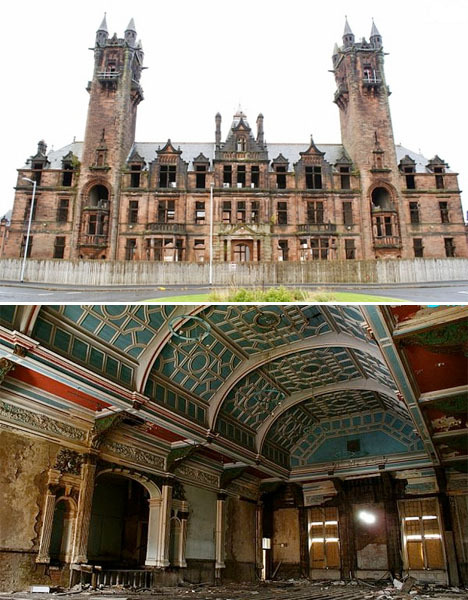 Scotland is home to abandoned insane asylums, railway stations, seminaries, luxury residences and more than one isolated island ghost town. 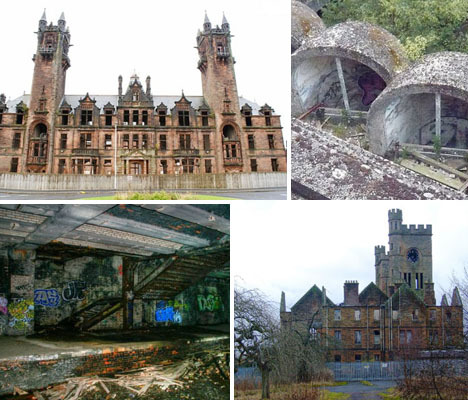 Situated on the eastern edge of Glasgow, Gartloch Hospital opened in 1896 as an asylum for poor people who were mentally ill (not that the put it that way at the time – the patients were referred to as ‘pauper lunatics.’) By 1904 it had 830 beds, and at the end of World War II, Gartloch was transformed into a medical services hospital, with psychiatric patients transferred elsewhere. The hospital closed for good in 1996 and in 2003, its incredible castle-like ruins were partially prepared for conversion to luxury apartments. 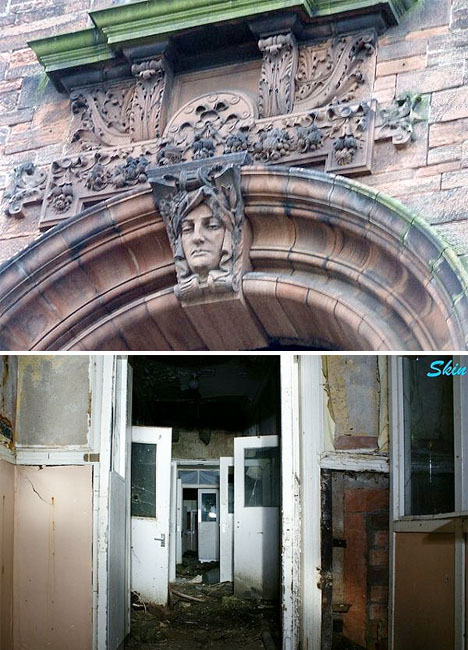 Most of it was demolished, with many of the remaining architectural elements turned into private residences, but some buildings, like the dining and recreation hall, are still on Scotland’s list of buildings at risk. 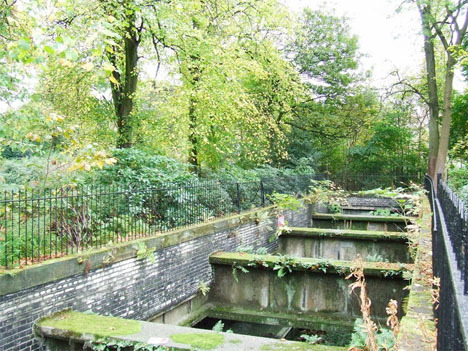 Deep beneath Glasgow’s famed Botanic Gardens is a mostly-forgotten railway station with two underground platforms that have spent the last 70 years decaying, becoming overrun by weeds and plastered in graffiti. The station opened in 1896 to much praise as it managed to bring heavy transportation to a well-used location without disturbing the picturesque setting. The red brick Victorian station closed permanently to passengers in 1939, and was destroyed by a fire in 1970. 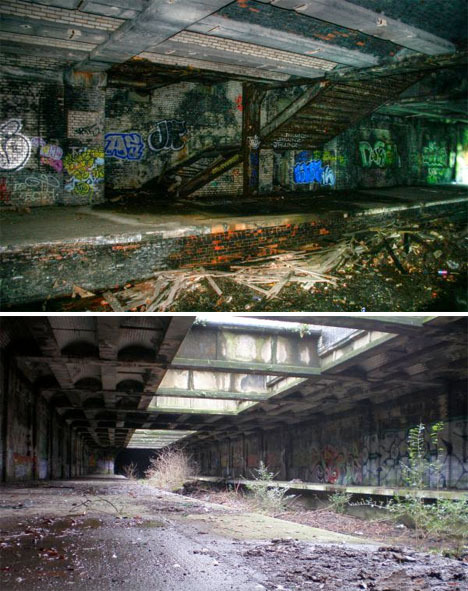 There’s no hint of the subterranean station at ground level other than a few moss-covered ventilation shafts, offering potential urban explorers a tantalizing peek at the abandoned tunnels below. There are currently no plans to redevelop the site. 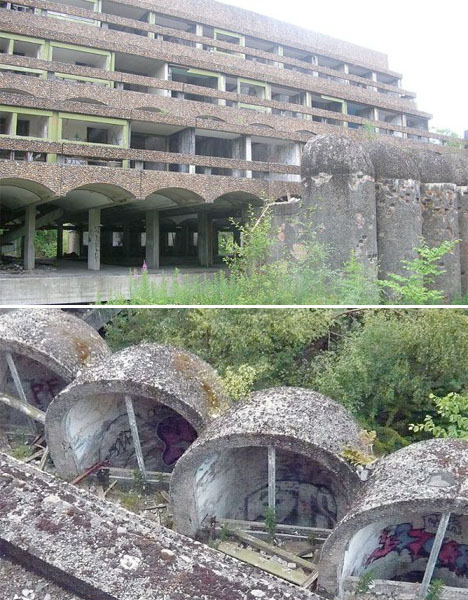 A striking example of Brutalist architecture has become even more noteworthy as it slowly erodes into a skeletal concrete monument hidden in an overgrown forest. 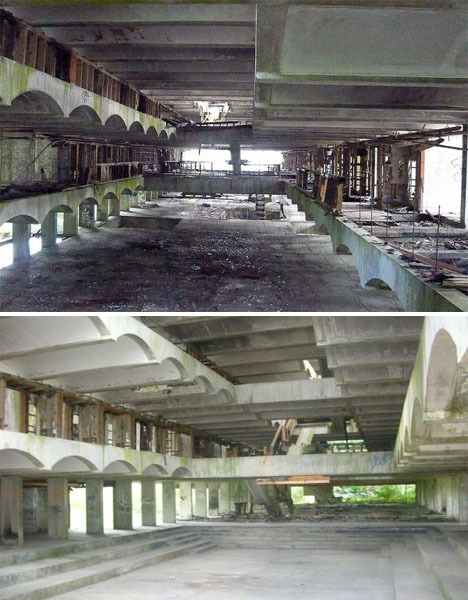 St. Peter’s Seminary has been described as one of Europe’s greatest modernist buildings, but since its abandonment by the Catholic church in 1980, it has decayed into “Scotland’s creepiest building.” Architecture students who want to get a look often have trouble even finding it in the 140-acre wood. The structure opened in 1966 but was almost immediately obsolete as the Catholic church had decided in 1966 that priests should be schooled in the urban churches of Europe rather than secluded rural locations, so it was never fully occupied. It briefly became a drug rehabilitation center before closing for good. A new movement to turn it into an arts college and transform the surrounding area into a public space may spell hope for its future. Another properly creepy abandoned hospital was built in a location specifically chosen for how isolated it was, in the small village of Hartwood. 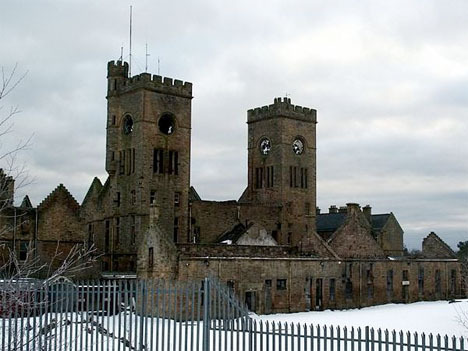 Consisting of a number of buildings as well as its own power plant, water reservoir, farm, gardens, cemetery and railway line, the hospital opened in 1895 and quickly gained a reputation as a cutting-edge treatment facility for mental illness where patients underwent then-unheard-of therapies like electric shock treatment and lobotomies. As with many other hospitals in the area, it closed in the 1990s after a new law focusing on community-based therapy and long-term mental health care was enacted. The last two wards weren’t closed until 2010, but the facility already looks as if it’s been abandoned for decades, and several fires have destroyed the ballroom, kitchen block and admin space. 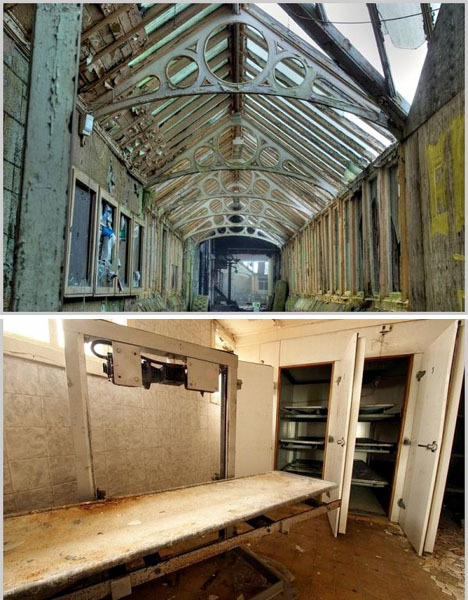 It’s still owned by the health board and there’s no word of redevelopment.